Pune, Dec 3: Chennaiyin FC got the better of FC Pune City by a solitary goal in the Indian Super League season four clash to move to the second spot at the Shree Shiv Chhatrapati Sports Complex, Balewadi Stadium here on Sunday. 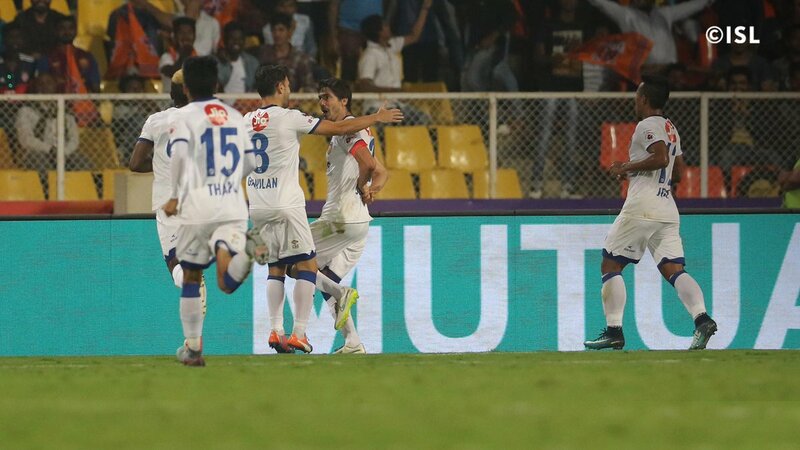 A 82nd minute goal from captain Henrique Sereno was enough for the former ISL champions to win their second match on the trot after the disastrous opening day loss against FC Goa. After a cagey opening 15 minutes, Pune took control but couldn't create any clear-cut goal scoring chances. Some of their best chances of the half came from set plays. Marcos Tebar's free-kick in the 19th minute was headed down by a Pune player to Alfaro, who in turn passed it on to Rafael Lopez. But the Spanish defender's side-footed shot went inches wide of the Chennaiyin goal. Chennaiyin FC's best chance of the first half fell to Gregory Nelson in the 40th minute. After stringing together a few passes in midfield, Inigo Calderon sent in a delightful cross into the box for Nelson to meet. The Dutchman's diving header, however, was cleared well off the line by Rafael. Both sides started the second half much like the first -- unable to create chances going forward. In the 60th minute, Pune goalkeeper Vishal Kaith almost gifted a goal to John Gregory's side. The goalkeeper came out of his box to collect a harmless-looking cross from Jerry Lalrinzuala but could only palm it in the path of midfielder Francisco Fernandes. Rafael, however, was again in the right place at the right time to make another goal-line clearance. At the other end, Alfaro should have given Pune the lead in the 77th minute. After finding himself clear on goal with only the goalkeeper to beat, the Uruguayan slashed the ball over the crossbar. It looked like both sides would settle for a point each but there was a twist in the tale. With just eight minutes left for the final whistle, Sereno gave Chennaiyin FC the lead. The defender rose above everyone to thump Gavilan Martinez's corner past the FC Pune City goalkeeper.